A few years ago my friend Genie introduced me to the world of felting. Prior to this I had no idea about felting and it seemed like a very daunting task. However, what I quickly discovered is that felting is very easy, so easy even little kids can do it! The basic idea with felting is that you are taking wool fibers, called roving and rubbing them together under warm water so that the fibers shrink and intertwine to form a piece of felt. This week the Bee and I did some felting. This is a great activity for toddlers and preschoolers, it involves playing in the sink with soap and water and there is no way to mess up, because the more they play with the fibers the more felted they get. 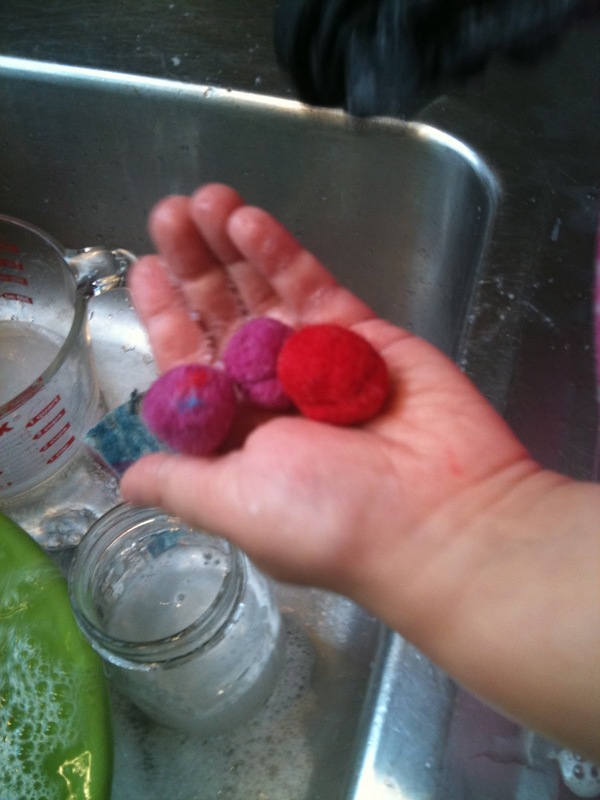 Felting is also a great way to teach kids about the process of taking sheep's wool and turning it into felt and yarn. To make our felt ball garland, we begin by selecting some wool roving. If you don't have wool roving you can get it at most craft stores (Michael's, Jo-Ann's) in any specialty wool shop (there are a few great ones in Baltimore) or online. Roving is basically dyed and combed sheep's wool and comes in any color you could possibly want. We selected some warm colored roving for our garland, since I wanted it to be something that could be up for the holiday season but also stay on display for other times of year. 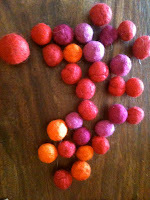 I then separated strands of roving into clumps and wrapped the clumps around each other to form loose little balls. Then I added a little soap, we just used dish soap, to the clump and begin rolling it between the palms of my hand. If you have ever made balls like for cookies, meat balls, or even play dough, it is the same technique. I then rinsed the ball under warm water and rolled again repeating the process until I had a little felted ball. The Bee did a few balls but was mostly interested in playing with the ones I had made and making her own stuff out of the roving. I set a cutting board in a bowl of warm water so she could explore with the roving. 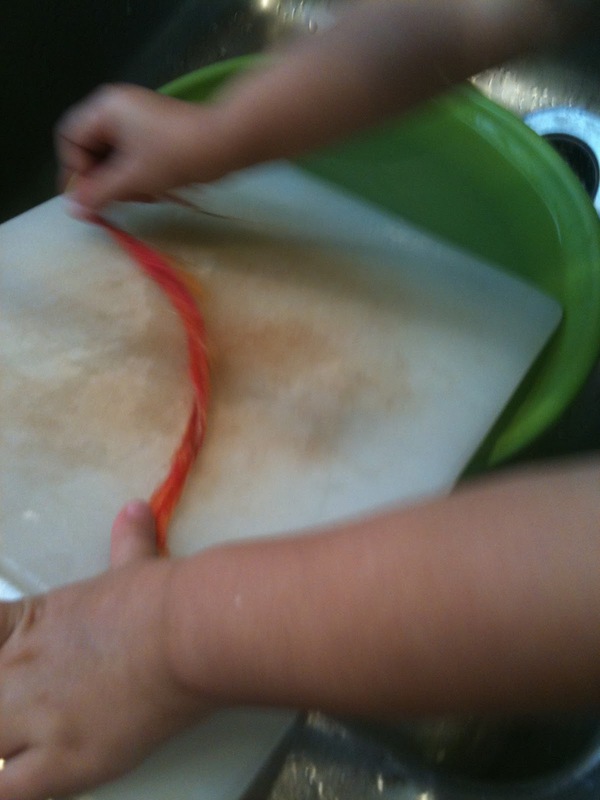 She really liked rolling it out, like a worm and ended up with a bunch of felted strands, which look really neat. 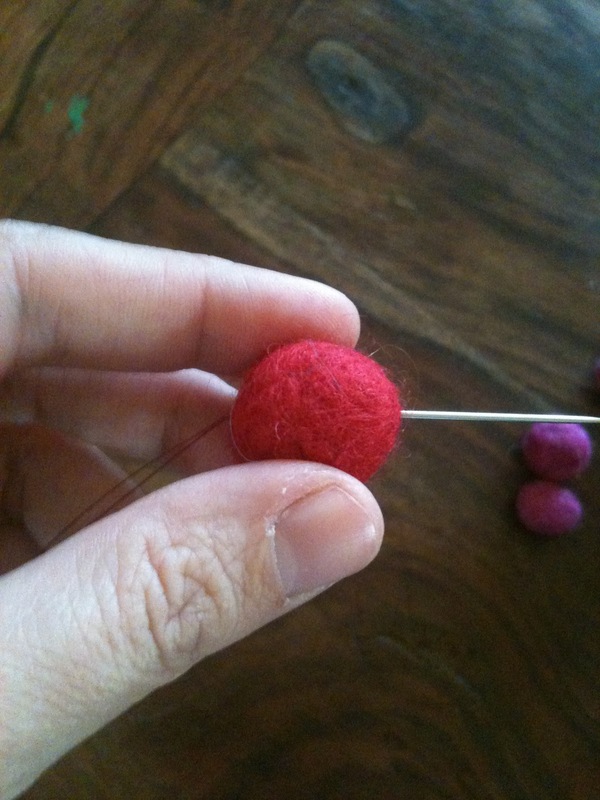 Once we had made a bunch of little balls, which doesn't take very long but does give your arms a good work out, we strung them together with a needle and thread to make a garland. The garland is currently hanging on our fireplace mantle but I hope to hang it upstairs once the holiday is over. 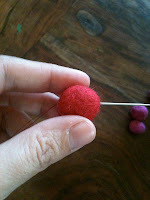 I should also mention that there is a much easier way to make felted balls in mass, using an old stocking and your washing machine. I have used the washing machine technique before and it works great but is not nearly as fun for 3 year olds!